Define : i) Tonnage of refrigeration ii) Coefficient of performance. i) Tonnage of Refrigeration – is defined as the amount of refrigeration effect produced by uniform melting of one ton (1000Kg) of ice from and at 00 in 24 hours. . The P-H and T-S diagram for the simple vapor compression refrigeration cycle is shown in the figure for vapour entering the compressor is in dry saturation condition The dry and saturated vapour entering the compressor at point 1 that vapour compresses isentropic ally from point 1 to 2 which increases the pressure from evaporator pressure to condenser pressure At point 2 the saturated vapour enters the condenser where heat is rejected at constant pressure, due to rejection of heat decreases the temperature and change of phase takes place i.e. 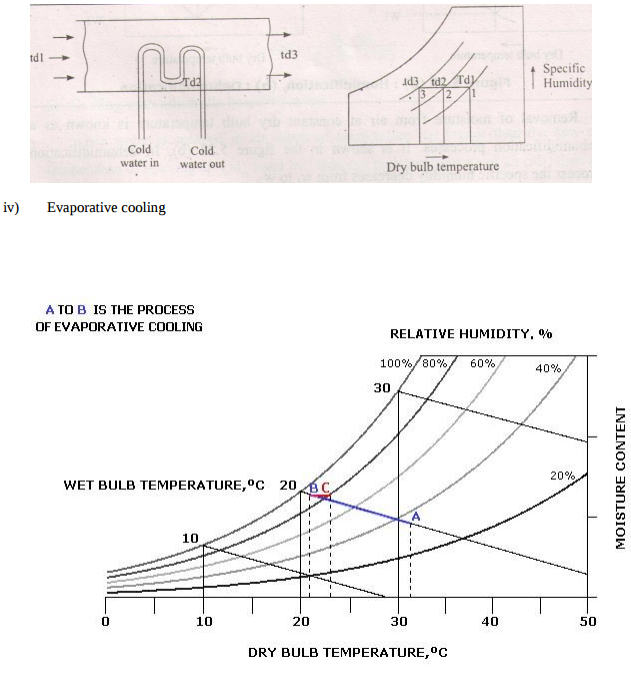 latent heat is removed and reaches to liquid saturation temperature at point 3 then this liquid refrigerant passed through expansion valve where liquid refrigerant is throttle keeping the enthalpy constant and reducing the pressure. 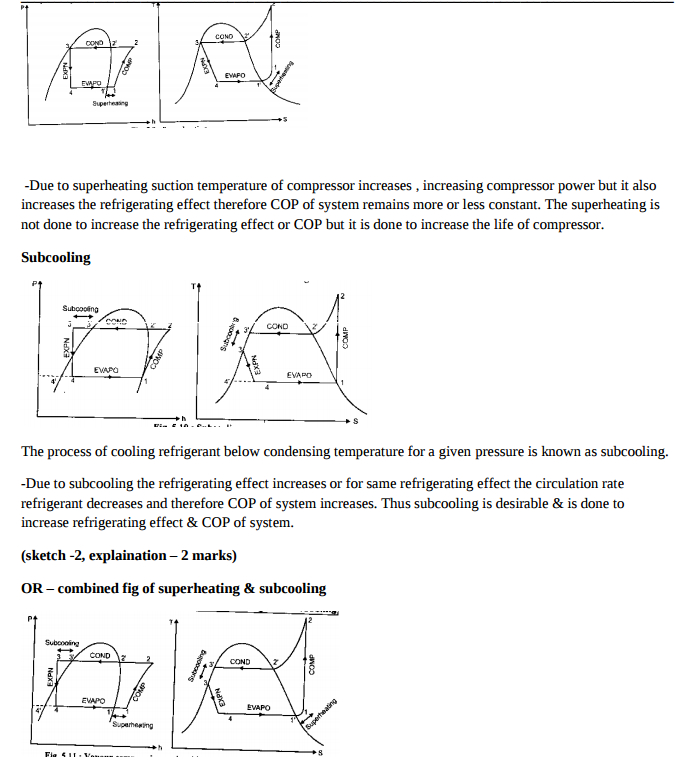 Effect of superheating: As shown in the figure a & b the effect of superheating is to increase the refrigerating effect, but this increase in the refrigerating effect is at the cost of increase in amount of work spent to attain upper pressure limit. Since the increase in work is more as compared to increase in refrigerating effect, therefore overall effect of superheating is to give a low value of C.O.P. ii) Effect of sub-cooling: sub-cooling is the process of cooling the liquid refrigerant below the condensing temperature for a given pressure. 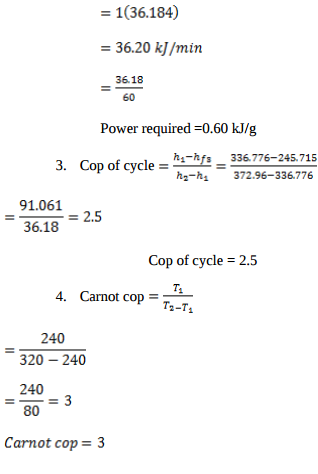 In figure the process of sub-cooling is shown by 2’-3’. As is evident from the figure the effect of sub-cooling is to increase the refrigerating effect. Thus sub-cooling results in increase of C.O.P provided that no further energy has to be spent to obtain the extra cold coolant required. Name the refrigerants used for : i) Water cooler ii) Domestic refrigerator iii) Ice plant iv) Cold storage. Define : i) WBT ii) DPT iii) DBT iv) Degree of saturation. i) WBT: Wet bulb Temperature twb : It is the temperature recorded by a thermometer when its bulb is covered by a wet cloth exposed to the air. ii) DPT: Dew point temperature tdp :It is the temperature of air recorded by thermometer, when the moisture (water vapour) present in its, begins to condensed. iii) DBT: Dry Bulb Temperature tdb : It is the temperature of air recorded by ordinary thermometer with a clean, dry sensing element . iv) Degree of Saturation (μ):Degree of saturation is defined as ‘the ratio of mass of water vapour associated with unit mass of dry air to mass of water vapour associated with saturated unit mass of dry air at same temperature. 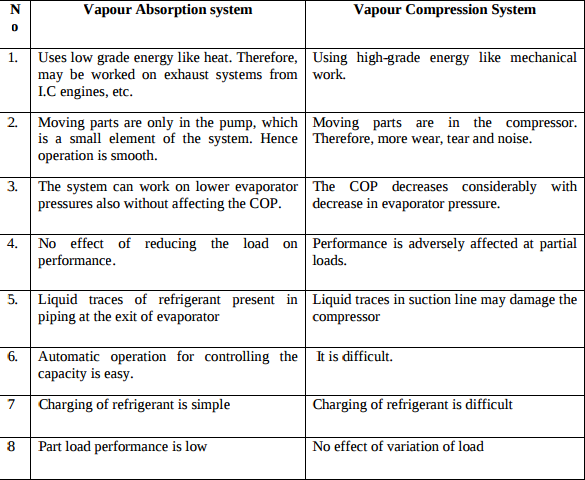 Explain the working of simple vapour absorption refrigeration system. Working of Simple Vapor absorption system: A Simple Vapor absorption system consists of evaporator, absorber, generator, condenser, expansion valve, pump & reducing valve. In this system ammonia is used as refrigerant and solution is used is aqua ammonia. Strong solution of aqua ammonia contains as much as ammonia as it can and weak solution contains less ammonia. The compressor of vapor compressor system is replaced by an absorber, generator, reducing valve and pump. The heat flow in the system at generator, and work is supplied to pump. 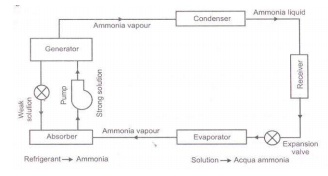 Ammonia vapors coming out of evaporator are drawn in absorber. The weak solution containing very little ammonia is spread in absorber. The weak solution absorbs ammonia and gets converted into strong solution. This strong solution from absorber is pumped into generator. The addition of heat liberates ammonia vapor and solution gets converted into weak solution. The released vapor is passed to condenser and weak solution to absorber through a reducing valve. Thus, the function of a compressor is done by absorber, a generator, pump and reducing valve. The simple vapor compressor system is used where there is scarcity of Electricity and it is very useful at partial and full load. Draw a neat block diagram of vapour compression cycle. Show the direction of flow ofrefrigerant. Draw only a neat labelled sketch of window air-conditioner. Represent following processes on Psychrometric chart. i) Heating with humidification ii) Sensible heating. 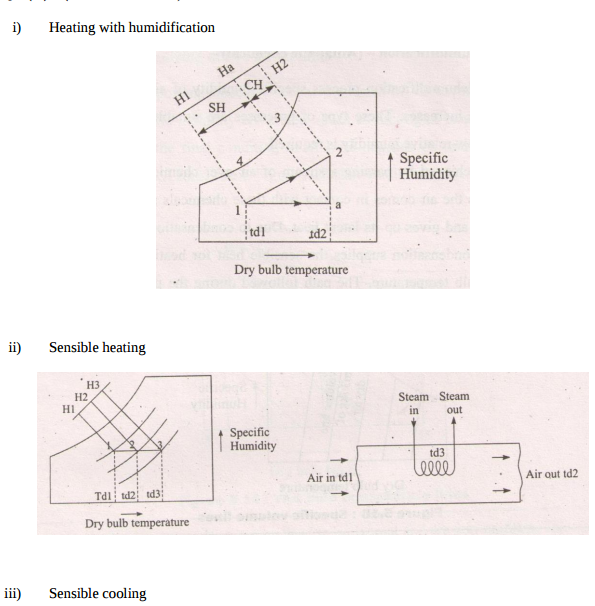 iii) Sensible cooling iv) Evaporative cooling. Enlist the four effects of subcooling on the performance of V.C.C. refrigeration cycle. 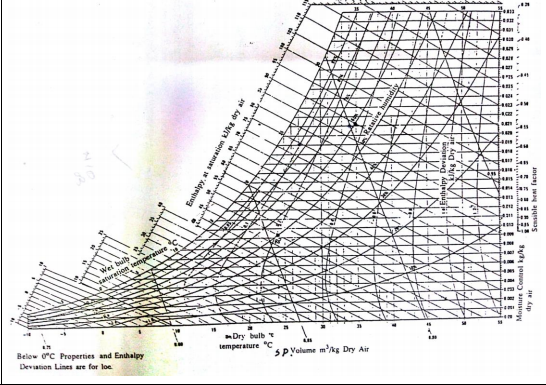 Explain with neat block diagram the working of ‘Vapour Absorbtion Cycle’. Explain with neat sketch construction and working of ice plant. 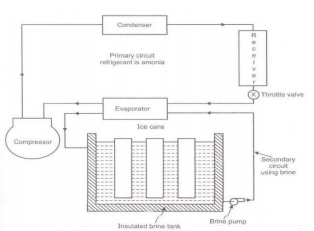 Working of Ice plant: The main cycle used for ice plant is vapor compression cycle with ammonia as the refrigerant in primary circuit and brine solution in secondary circuit. Brine solution takes heat from water in secondary circuit and delivers the heat to ammonia in primary circuit. Thus, the indirect method of cooling is used in ice plant. In secondary circuit brine is cooled in evaporator and then it is circulated around the can which contains water. The heat is extracted from the water in the can and is given to the brine. 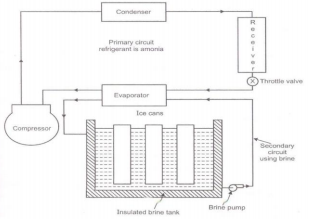 The brine is contentiously circulated around the can with the help of brine pump till entire water in the can is converted into ice at -6 0 C. Ammonia vapor coming out of evaporator is compressed to high pressure and then these vapors are condensed in the condenser. High pressure liquid ammonia is collected in the receiver and it is passed through the expansion valve to reduce its pressure and temperature as per requirement. The throttle liquid ammonia at low temperature & low pressure enters in evaporator, which are the coils dipped in brine tank. 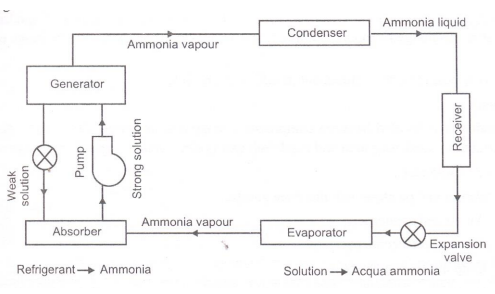 The liquid ammonia absorbs heat from brine and gets converted into vapors, which are drawn by suction line of compressor. i) DPT – Dew point temperature tDP - It is the temperature at which air water vapour mixture starts to condense. D.P.T. of mixture is defined as the temperature at which water vapours starts to condense. Ii) WBT - Wet bulb temperature - tWB - It is the temperature recorded by thermometer when its bulb is covered with wet cloth known as wick and is exposed to air. 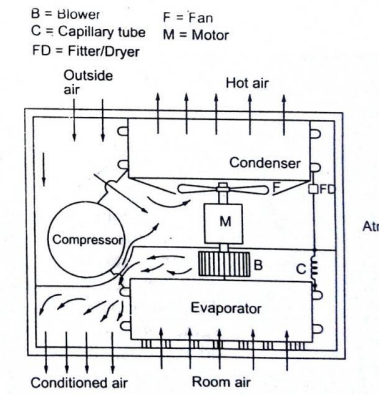 Draw neat sketch of split air conditioner and name the parts. Explain vapour compression refrigeration (for dry saturated state of refrigerant) cycle with the help of P-h and T-s charts. 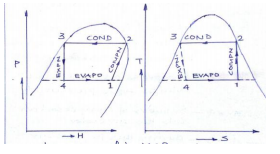 Processes in VCR cycle 1) The point 1 represents condition of refrigerant at entry of compressor which is wet. 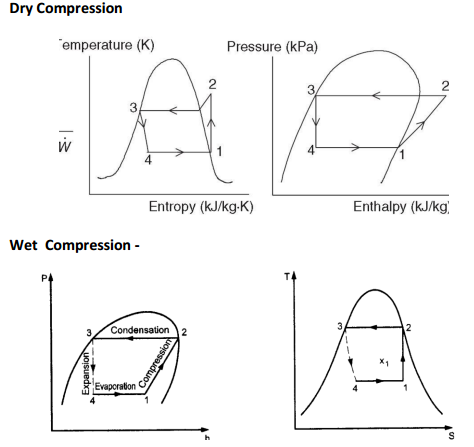 Process 1 – 2 – Isentropic compression of refrigerant vapour till it becomes dry and saturated. Process 2 – 3 – Condensation of vapour refrigerant up to saturated liquid condition at constant pressure. Process 3 – 4 – Expansion of liquid refrigerant by expansion device. This reduces pressure as well as temperature of liquid refrigerant. 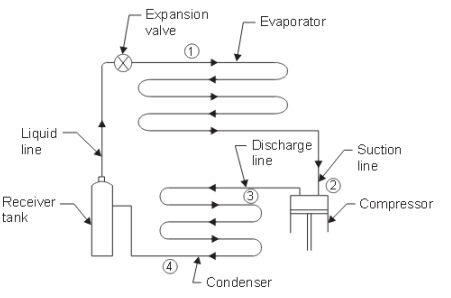 Process 4 – 1 – Evaporation of liquid refrigerant in the evaporator thus establishing required refrigerating effect. Thus it completes one cycle of refrigeration. 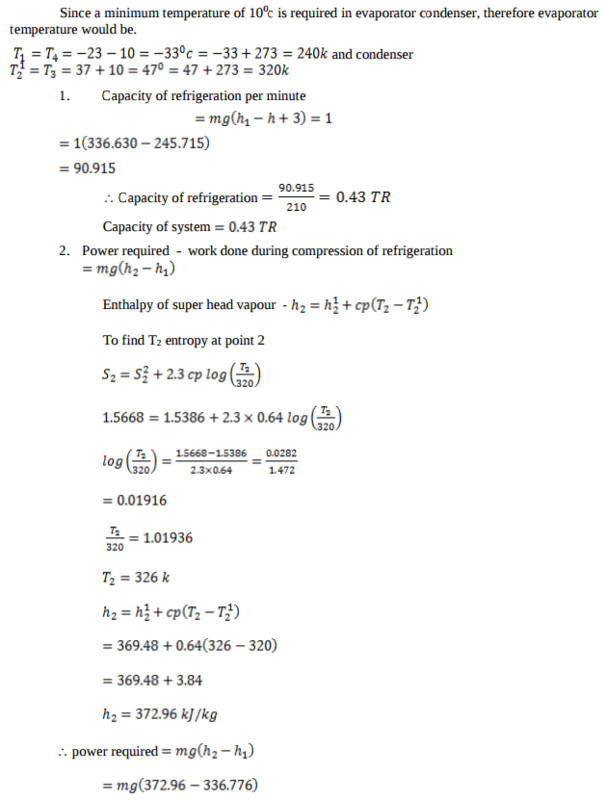 Refrigerating effect = RE = m (h1 – h4) Compressor power = m (h2 – h1) Where m = mass flow rate of refrigerant in kg/sec. Vapour compression refrigeration cycle Vapour compression refrigeration cycle consist of four different processes 1) Compression 2) Condensation 3) Expansion 4) Evaporation Components and its functions 1) Compressor – The low pressure & temperature refrigerant from evaporator is drawn into compressor. It is compressed to a high pressure & high temp. vapour refrigerant is discharged into condenser. 2) Condenser – High pressure & temperature vapour refrigerant is cooled and condensed by using air or water & form liquid vapour refrigerant. Heat is rejected 3) Expansion valve – to control flow of refrigerant and reducing it pressure and temperature 4) Evaporator – liquid vapour refrigerant at low pressure and low temperature is evaporated by absorbing heat from system or substance and change into vapour refrigerant. 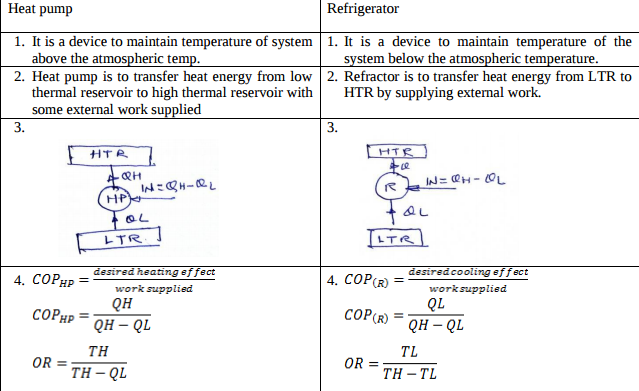 Differentiate between heat pump and refrigerator. 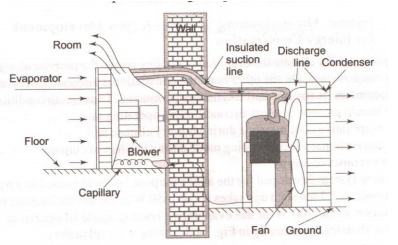 Explain the working of window air conditioner with neat sketch. 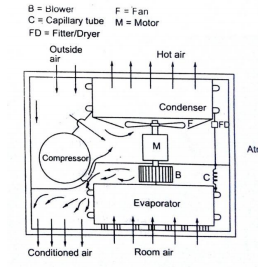 The low pressure and low temperature refrigerant vapour from evaporator is sucked by compressor. The compressor compresses the vapour to high pressure and high temperature and discharges to the condenser. On the condenser the refrigerant vapour condenses by dissipating heat to the cooling medium (air) the liquid refrigerant coming out of condenser passes through filter, dryer into capillary tube where it is again throated back to the evaporated pressure. The low pressure low temp liquid refrigerant then flows to evaporator which it boil off by extracting heat from air to be circuited to the conditioned space. Heating with Dehumidification process : By this process, specific humidity of air decreases and its dry bulb temperature increases. This type of process is suitable for industrial air conditioning where low relative humidity is required. This process is achieved by passing a stream of air over chemicals which have an affinity for water. The process is shown in figure. A Simple Vapor absorption system consists of evaporator, absorber, generator, condenser, expansion valve, pump & reducing valve. In this system ammonia is used as refrigerant and solution is used is aqua ammonia. Strong solution of aqua ammonia contains as much as ammonia as it can and weak solution contains less ammonia. The compressor of vapor compressor system is replaced by an absorber, generator, reducing valve and pump. The heat flow in the system at generator, and work is supplied to pump. 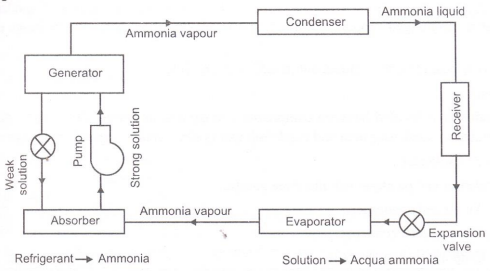 Ammonia vapors coming out of evaporator are drawn in absorber. The weak solution containing very little ammonia is spread in absorber. The weak solution absorbs ammonia and gets converted into strong solution. This strong solution from absorber is pumped into generator. The addition of heat liberates ammonia vapor and solution gets converted into weak solution. The released vapor is passed to condenser and weak solution to absorber through a reducing valve. Thus, the function of a compressor is done by absorber, a generator, pump and reducing valve. The simple vapor compressor system is used where there is scarcity of electricity and it is very useful at partial and full load. Explain construction and working of ice plant with neat sketch. The main cycle used for ice plant is vapor compression cycle with ammonia as the refrigerant in primary circuit and brine solution in secondary circuit. Brine solution takes heat from water in secondary circuit and delivers the heat to ammonia in primary circuit. Thus, the indirect method of cooling is used in ice plant. 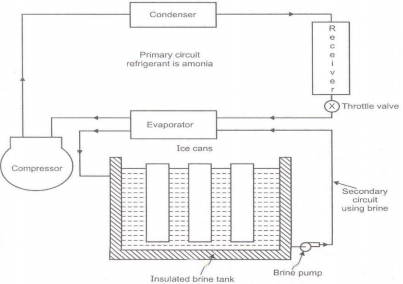 In secondary circuit brine is cooled in evaporator and then it is circulated around the can which contains water. The heat is extracted from the water in the can and is given to the brine. The brine is contentiously circulated around the can with the help of brine pump till entire water in the can is converted into ice at -6 0 C. Ammonia vapor coming out of evaporator is compressed to high pressure and then these vapors are condensed in the condenser. High pressure liquid ammonia is collected in the receiver and it is passed through the expansion valve to reduce its pressure and temperature as per requirement. The throttle liquid ammonia at low temperature & low pressure enters in evaporator, which are the coils dipped in brine tank. The liquid ammonia absorbs heat from brine and gets converted into vapors, which are drawn by suction line of compressor. 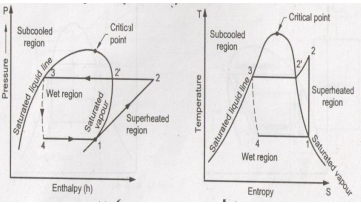 Represent subcooling and superheating on P-h and T-S diagram in refrigeration also give its effect on C.O.P. of refrigeration. Due to superheating suction temperature of compressor increases , increasing compressor power but it also increases the refrigerating effect therefore COP of system remains more or less constant. The superheating is not done to increase the refrigerating effect or COP but it is done to increase the life of compressor. The process of cooling refrigerant below condensing temperature for a given pressure is known as sub-cooling. Due to sub-cooling the refrigerating effect increases or for same refrigerating effect the circulation rate refrigerant decreases and therefore COP of system increases. Thus sub-cooling is desirable & is done to increase refrigerating effect & COP of system. 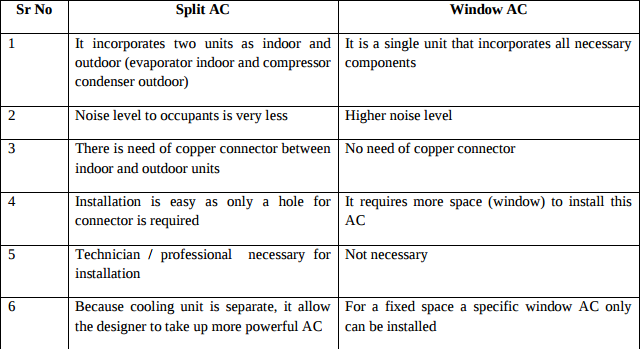 Give classification of air conditioning system. Define: 1) DPT 2) WBT 3) DBT 4) moist air. Define following terms: 1) specific humidity 2) absolute humidity 3) relative humidity 4) degree of saturation. Specific humidity:- It is defined as the ratio of mass of vapour to the mass of dry air in a given sample of moist air.  Specific humidity ma mv  Absolute humidity:- It is defined as the actual mass of water vapour in unit volume of air. Its unit is gm/m3 Relative humidity:- It is defined as the ratio of partial pressure of water vapour in a given volume of mixture to the partial pressure of water vapour when same volume of mixture is saturated at the same temperature. Degree of saturation:- It is defined as the ratio of mass of water vapour associated with unit mass of dry air to the mass of water vapour associated with saturated unit mass of dry air at same temperature. List any four applications of refrigeration. 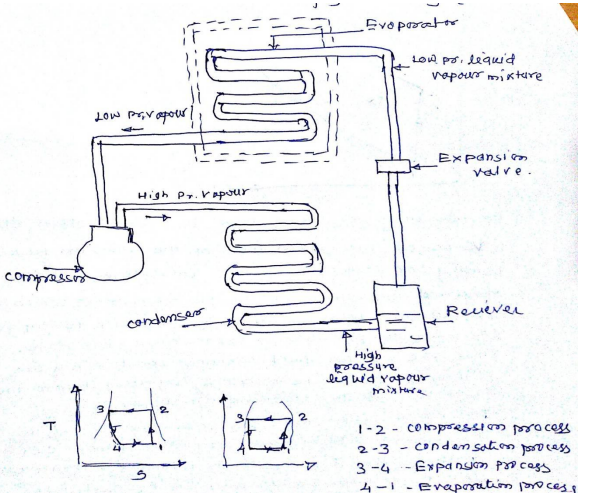 Explain working principle of simple vapour absorption refrigeration system. Represent it on the block diagram. Explain with neat sketch working principle of Ice plant. Define : i) DBT ii) WBT iii) DPT iv) Relative humidity. Give the classification of air conditioning systems. 2) Classification as to season of the year- i) Summer air-conditioning - These system control all the four atmospheric conditions for summer comfort. ii) Winter air-conditioning – This system is designed for comfort in winter. iii) Year round air-conditioning – These system consists of heating and cooling equipments with automatic control to produce comfortable condition throughout the year 3)According to equipment arrangement-Unitary and Central air conditioning.